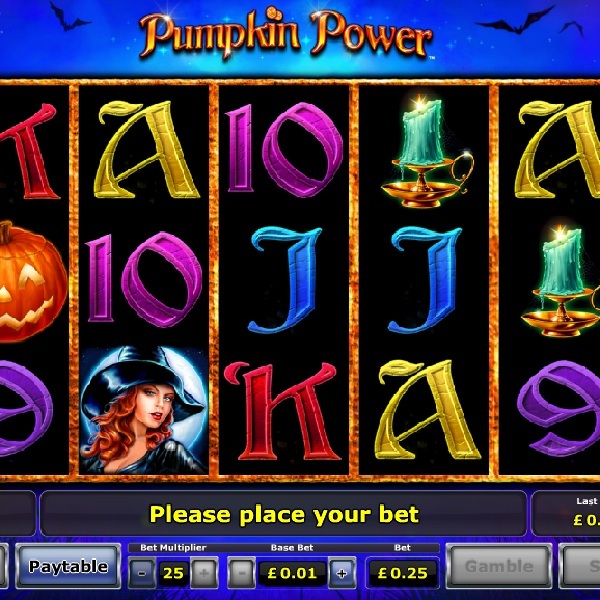 Keeping with the seasonal theme Novomatic has just released Pumpkin Power slot, a spooky Halloween themed game. It is a 5 reel slot with 243 ways to win. The reels are set against a barren backdrop featuring some silhouetted dead trees and fluttering bats. The high value symbols are a haunted house, a dripping candle, a black cat and a bat-themed ring. The red-haired witch is the wild symbol and can land on reels 2, 3 and 4 and there is a pumpkin scatter. If you land the pumpkin on reel 3 you get to roll a pair of dice to win a prize of 3x, 4x or 5x the symbol it lands on and 3, 4 or 5 free spins respectively. Landing three pumpkins awards 12 free spins. The slot has a betting range of £0.01 up to £37.50 and a top payout of 80x.